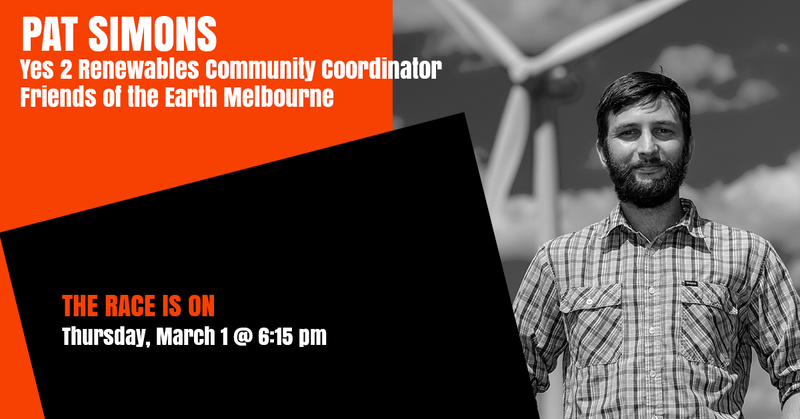 Pat Simons co-coordinated the Yes 2 Renewables campaign to bring home the Victorian Renewable Energy Target, and works with communities, businesses and workers around the state who love renewables. Pat has worked with Gasfield Free community groups in Victoria focusing on community owned renewable energy, and sees empowering the grassroots to take back control as essential to achieving social and environmental justice. He is currently working with communities who want wind and solar built in their region and campaigning to restore the national renewable energy target.